Tanganyika shell dwellers are dwarf cichlid species living in Lake Tanganyika on the African continent. All species inhabit sandy environments at the bottom of Lake Tanganyika. They are very popular among aquarists and easier to house than many other cichlids since they do not grow very big. One shell dweller from Lake Tanganyika will rarely claim a territory bigger than 10 square inches in the aquarium. Shell dwellers are also popular due to their charming personality and strong will; characteristics which they share with many of the larger cichlid species. Shell dwellers derive their name from the fact that they utilize abandoned shells to protect them selves from predators. When you keep Tanganyika shell dwellers, you will soon notice how rapidly they can escape into a shell as soon as they are frightened by something. You should never keep Tanganyika shell dwellers in an aquarium without shells, since this will make them fell extremely insecure and stressed. Even in an aquarium completely free from predators, the Tanganyika shell dwellers can still be scared from noises in the room or a person that is approaching the aquarium. Tanganyika shell dwellers are extremely good at picking up even the slightest vibrations. In Lake Tanganyika, the wild shell dwellers will prefer shells from Neothauma snails. When a Neothauma snail dies and vanish, its snail will soon become inhabited by a dwarf cichlid. In your aquarium the shell dwellers will appreciate shells from many other snail species just as much, as long as the shells stretch back at least two inches. The entrance to the shell must naturally be large enough for the cichlid to enter, typically one inch across. As your dwarf cichlids grow larger, you must of course give them larger and larger shells. If a shell dweller becomes too large for the shells in the aquarium it will become severely stressed and typically refrain from eating. If you do not place new, bigger shells in the aquarium the cichlid will loos its colours and eventually die. Shell dwellers are very suitable if you want to keep cichlids but do not have a very large aquarium. Even a 10 gallon aquarium can comfortably house most Tanganyika shell dwelling species. A 10 gallon aquarium is enough for 5 shell dwelling cichlids if you only choose fish from one peaceful species. As mentioned above, each fish will typically claim a territory no larger than 10 square inches. If you want to keep several species in the same aquarium the aquarium must be larger; 20 gallons or more even for peaceful species. Two spawning shell dwellers can be kept in a 5 gallon aquarium during the breeding period. Since the sandy bottom of Lake Tanganyika is the natural environment for all Tanganyika shell dwellers, they will appreciate an aquarium with a sandy substrate. Place at least 2 inches of sand at the bottom of the aquarium, since the shell dwellers like to move around their shells a lot and dig in the sand. Do not use fine gravel instead of sand in the aquarium, since gravel can harm the shell dwellers when they are dragging their shells around. Some aquarists have however reported keeping Tanganyika shell dwellers in aquariums with extremely fine gravel without noticing any injuries. The aquarium must naturally be decorated with plenty of shells; several shells are needed for each cichlid. Shells are usually sold in pet shops and fish stores. You can also visit a craft or hobbyist shop, since they frequently sell very beautiful shells as decorations. Rocks and plants are also suitable aquarium decorations, but Tanganyika shell dwellers are phenomenal diggers and can uproot plants. When you choose plants for the aquarium it is therefore recommended to pick sturdy species that can tolerate some digging, such as Java fern and Java Moss. Plastic plants are also an option. Since all Tanganyika shell dwellers hail from Lake Tanganyika, they will appreciate the same water chemistry. Keep the pH between 8.0 and 8.3 and the hardiness between 10.0 and 20.0 dH. It is easier to keep the water chemistry ideal if your place some Oceanic rock or Tuffa rock in the aquarium. You can also use chemicals sold in pet stores to buffer the pH and water hardness. The required amount of filtration and water changes will chiefly depend on the size of the aquarium, but also on the fish, the food and the presence of rocks. For a small 10 gallon aquarium, a ‘hang on back’ filter or a small canister filter is the most practical solution. Feed your Tanganyika shell dwellers a varied diet to make sure that they receive all necessary nutrients. Feeding them twice a day is enough. Vegetable based flake food can be a good base when combined with meaty foods such as bloodworms and brine shrimp. The larger shell dwelling species can also be trained onto accepting small pellets suitable for cichlids. Neolamprologus multifasciatus –shell dweller from lake Tanganyika. For the novice cichlid keeper, the Tanganyika shell dweller named Neolamprologus multifasciatus is a very suitable choice. Neolamprologus multifasciatus is also appropriate if your aquarium is small. This species is commonly sold as 'The Many Banded Shell Dweller' or simply 'The Multi', and is found in most fish shops. 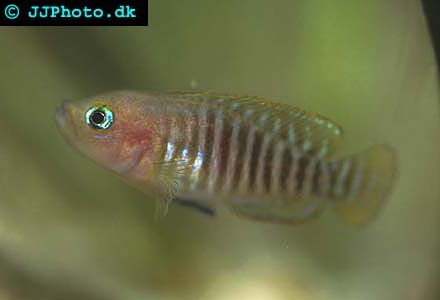 Neolamprologus multifasciatus is one of the smallest cichlid species in the world and is also very docile and non-aggressive. If you are inexperienced, but have a somewhat larger aquarium, the Neolamprologus brevis is also a highly suitable species. It is easy to keep even for beginners, but will grow bigger than the Neolamprologus multifasciatus and requires more space. For those who wish to combine Tanganyika shell dwellers with other types of fish in the aquarium, other Tanganyika species is the best suggestion since they will like the same water chemistry and temperature as the shell dwellers. Free swimming cichlids like the Aulonocranus species will usually do well with shell dwellers. If you want to keep some algae eaters to keep the aquarium clean, Bristlenose Plecos are a good choice. If you choose bottom dwelling species it is important that they are not too timid, since they will share the bottom with the shell dwellers and might have to compete for space. It is comparatively easy to breed Tanganyika shell dwellers in aquariums. The female shell dweller will deposit her eggs in a shell, and the spawning site will be guarded violently if necessary. Tanganyika shell dwellers will typically display aggressive behaviour during the breeding period. An average batch will contain 20-40 eggs, but the number can vary a lot between different shell dwelling species. The number of eggs, as well as the size of the eggs, is also affected by the size of the female. If you are a novice keeper, the Neolamprologus multifasciatus is a good beginner choice since Neolamprologus multifasciatus is not at all hard to get into spawning condition in captivity.